Find the location where computer A stores its OneNote files. Find the location where computer B stores its OneNote files. Transfer the files themselves from A to B. Ideally, you will use the same version of OneNote on both computers, but if not, don’t fret – tips and solutions for handling those cases are included below as well. 1. Open OneNote, click Tools, then click Options. 2. In the left-hand pane, click Open and Save. 3. Note the location marked My Notebook. This is where your OneNote files can be found. 4. 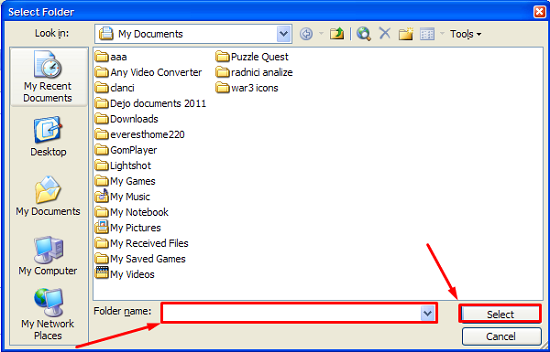 If you wish to change the default location where your notes are saved because the default path is too long or too complicated, click Modify, choose the folder or make a new one, write its name in the box and click Select. 5. Mark this location down as Location A. Give it a distinct name. Save it and then search for it via the Search function in your operating system. There are several ways to transfer files, the easiest being USB drive. First, make sure Microsoft OneNote isn’t running on either computer. Plug your USB drive into computer A, send your notes from location A to your USB, plug the USB into computer B and copy the notes from it to location B. Another solution for sending files is to attach your notes to an e-mail on computer A, send that email to your own e-mail address and then download the attachment on computer B. Note that you cannot upload a folder as an attachment, instead, you need to zip the folder and then upload it. This method is perhaps the best, because it doesn’t require creating an entirely new SkyDrive or Google Drive account solely for the purpose of uploading a file to the Internet. Also, you will now have your notes backed up in your inbox, which is always a smart idea. What happens if I use different versions of OneNote on computer A and B? This is where things become tricky. As versions of any program progress, it becomes more difficult for the creators of that program to maintain compatibility with older versions. At some point, older version simply stop functioning in new versions of the program. This applies to OneNote as well. A big version gap will certainly cause the loss of some part of your notes, or may even result in their total corruption. 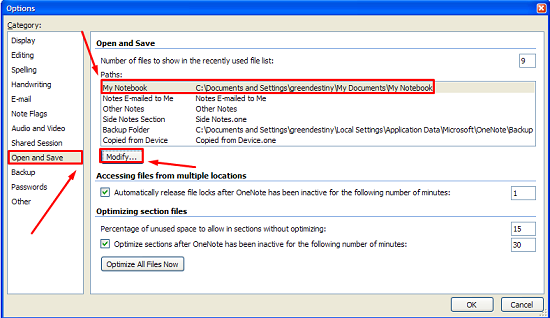 The best option is to always transfer your notes to the next later version: from 2003 to 2007; from 2007 to 2010 etc. The pictures in this guide are from Microsoft OneNote 2003, but the same principles apply across all OneNote versions. In later versions of OneNote, the names are slightly changed: the Open and Save tab is called Save and the My Notebook location is called Default Notebook Location, but the basic meaning behind labels is in all cases the same.